The New, New Framework For AP U.S. History : NPR Ed After its 2014 Advanced Placement U.S. history framework became a target of intense criticism, the College Board did something unusual: It agreed to a rewrite. The College Board has just released the latest curriculum framework for its Advanced Placement U.S. history course, and it appears to have satisfied many of the old framework's critics. The rewrite comes after anger over its 2014 framework sent the College Board, which administers the AP exam, back to the drawing board. It agreed to revise in an attempt to quell what had become a national controversy over how to teach issues like imperialism, slavery, racism and American identity. America doesn't have a national history curriculum, but the AP U.S. history course comes close. Last year, nearly half a million high school students sat for the AP exam, with top scorers earning many millions of dollars worth of college credit. The controversial 2014 framework — meant to help teachers prepare students for a new AP exam — was the first update since 2006, and it signaled a big shift away from important names and events toward interpretation and comprehension: debating ideas instead of regurgitating facts. High school students held a protest against a Jefferson County School Board proposal to emphasize patriotism in the teaching of U.S. history, at Ralston Valley High School, Arvada, Colo., in September. 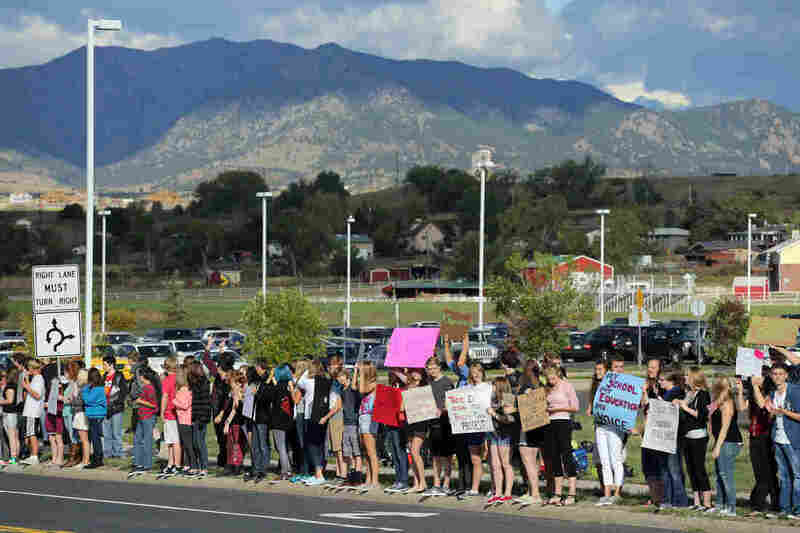 The protests were over the Colorado school district's proposal to promote patriotism and de-emphasize civil disobedience in American history classes. But critics argued that the new framework presented a view of the country's history that was too negative and too political. A retired AP U.S. history teacher named Larry Krieger, who now runs a test prep and tutoring company, was among the first to raise the alarm about the curriculum guide. He connected to a network of education activists who had already mobilized against issues like the Common Core and standardized testing. Eventually, the Republican National Committee passed a resolution that called the framework "radically revisionist." And policymakers in several states — including Oklahoma, Georgia, Colorado and Texas — introduced proposals hoping to force a revision. Specific objections ranged from the framework stating that the nation's founders believed in "white superiority" and that white Southerners had "pride in the institution of slavery" to a line calling former President Ronald Reagan "bellicose." What happened next took some critics, including independent historian Jeremy Stern, by surprise. The College Board listened. It reached out and eventually hired Stern as a consultant on a revision. "It's very unusual for any educational organization to respond to serious criticism by actually listening to it," he says. "The usual response is to raise the drawbridge." The new 2015 framework has been rewritten to create what the College Board called in a statement "a clearer and more balanced approach." For example, in the 2014 version, Europeans "helped increase the intensity and destructiveness of American Indian warfare." Now it says simply that the Europeans' introduction of guns and alcohol "stimulated changes" in native communities. In the section on World War II, students are told that Americans saw the war as a fight for freedom and against fascism; last year's version talked about Japanese internment camps and the atomic bomb — with no mention of the Holocaust. And Reagan? He's no longer "bellicose" toward the Soviet Union but simply gives "speeches" and engages in "a buildup of nuclear and conventional weapons." Some of them, yes. Rick Hess, a conservative education expert at the American Enterprise Institute and a former high school social studies teacher, didn't think much of the 2014 version, but he published a piece in the National Review saying the new framework is "not just better, it's flat-out good." "I thought what came out felt much more robust, much more historically accurate," he tells NPR. On the other hand, now some liberals and progressives say they preferred the more critical perspective of last year's version. Like Alexandros Orphanides, a high school history teacher in New York City, who writes about education. "If you are critical of things like income inequality or institutionalized racism, then you won't have the lens to evaluate the present — if you've been indoctrinated in a patriotic, jingoistic, nationalistic view of history," he says. In the education policy world, Hess sees a happy ending. Like Stern, he gives the College Board credit for listening to its critics. "Of all the culture wars we've been engaged in, this is the happier outcome," Hess says. Of course, in a broader sense, the culture wars are very much alive. The debates in the news today — over whether to take down the Confederate flag or sign a nuclear deal with Iran — are forcing Americans to reckon with some very big, very old ideas about American exceptionalism, freedom, military power and racism. And for many young people, those debates start in history class. 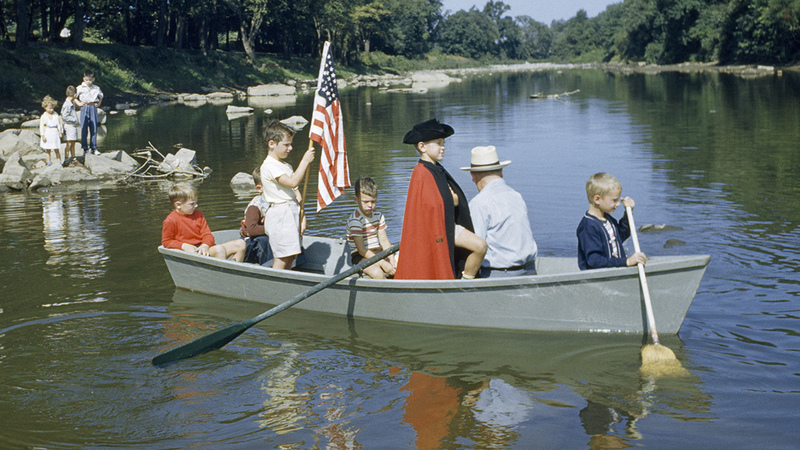 American boys re-enact George Washington's crossing of the Delaware River in 1776. William Faulkner wrote, "The past is never dead. It's not even past." And that's never more true than when people start arguing over how American history should be taught in school. The current fight involves the Advanced Placement U.S. history exam. Nearly half a million high school students took the test last year, hoping to earn college credit. This school year, the nonprofit College Board unveiled a redesign of the course that's meant to prepare AP teachers and their students for the exam. And some state lawmakers are calling the new framework "distorted" and "revisionist." An Oklahoma House committee voted earlier this month to review the guidelines and potentially cut funding for AP U.S. history classes there. Other anti-AP proposals have come up in Texas, Georgia, Nebraska, North Carolina and Tennessee. The new course and exam description is extensive — more than 120 pages — but some conservative lawmakers argue it's not extensive enough. "In the new framework, little if anything is even emphasized about the Declaration of Independence or the Constitution or our war of independence. The founders are hardly even mentioned." And it's not just the founders. Critics are quick to point out that the new AP guidelines also leave out Rosa Parks and Martin Luther King Jr.
Much of the criticism now stirring up statehouses echoes a resolution that the Republican National Committee adopted at its big meeting last summer in Chicago. It said the new framework "reflects a radically revisionist view of American history that emphasizes negative aspects" while omitting or minimizing the positive. And it's not just what the College Board left out that has these lawmakers upset — but a key shift in focus, based on what did make the cut. Among the negative aspects of U.S. history that the framework highlights: The persecution of American Indians, slavery and the internment of Japanese-Americans during World War II. The list goes on. Georgia state Sen. William Ligon, an outspoken critic of the AP redesign, much preferred the old framework, which he says emphasized American exceptionalism. To him, the new course "looks at America through the lens of race, gender and class identity" and doesn't pay enough attention to "the things that unite us and set us apart from much of the rest of the world." The College Board has issued a full-throated rebuttal, making clear this framework was written by teachers and historians. It acknowledges that many famous documents and people, including Parks and King, go unmentioned. The explanation: These are guidelines, not a comprehensive curriculum. In fact, the Declaration of Independence, the Bill of Rights and the Emancipation Proclamation weren't mentioned in the old AP framework. That said, the College Board is listening to this debate. It's opened up a public feedback process through the end of this week and says, based on what it hears, it could make changes to the framework over the summer. While opposition to the new AP framework is fierce in some statehouses, the likeliest outcome in most cases is a state-led review of the new material. And it's unclear what consequences, if any, such a review would have. Dropping the course altogether would be unpopular with many students, parents and teachers. The College Board claims that, in Oklahoma alone, students are on track this year to earn nearly a million dollars in college credit through its AP U.S. history class. And last year, in Jefferson County, Colo., when the school board initiated its own review, students walked out of class. The effort in Oklahoma appears to have run into similar objections. A week after the anti-AP U.S. history bill cleared the state's House education committee, Fisher now says he's not trying to do away with the program or cut its funding.